My phone beeped interrupting my gaze over the loch as the train for Glasgow speeded up. I took my mobile out of my handbag. ‘There’s a package arrived from the publisher’ read a text message from my husband. I couldn’t believe it. I’d been waiting for that parcel for a few days. Even the guys who work at the garage next door knew that I was waiting for it because every time I came home from somewhere I checked with them if anyone left a parcel. 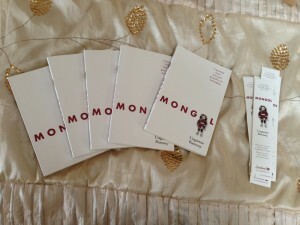 In the parcel were preview copies of my memoir ‘Mongol’. My husband sent me the photos of the books. He even filmed opening the package which was so sweet. He knew it was so important to me, to us. It’s a very exciting prospect to have the book in our hands. For real. The words, sentences that flew out of my heart, my head are now on paper. The feelings I felt writing it all in there, in print. There were times my husband would look at the tissues on my desk beside the laptop and ask: Are you having fun? There were times I lived and breathed only for this book it seemed. Still not having held a copy in my hands, later that morning, during a meeting my publisher Sara brought a copy for me herself. I held the book. Unbelievable. I looked at it and felt like calling my parents and my sister. I had mixed feelings. It’s such a lovely feeling seeing my book, but it is sad. It is sad that Billy isn’t here. This book wouldn’t have happened if it wasn’t for Billy. I promised Billy that I would make him live in people’s minds. I think that promise is this book. So I am pleased to see the preview of the book because it’s not just a book. It has a message. A message from a mother’s heart. This entry was posted in Mongol Memoir on August 28, 2013 by Uuganaa.